Disclosure: Please note that some of the links in this post are affiliate links and I will earn a commission if you purchase through those links. 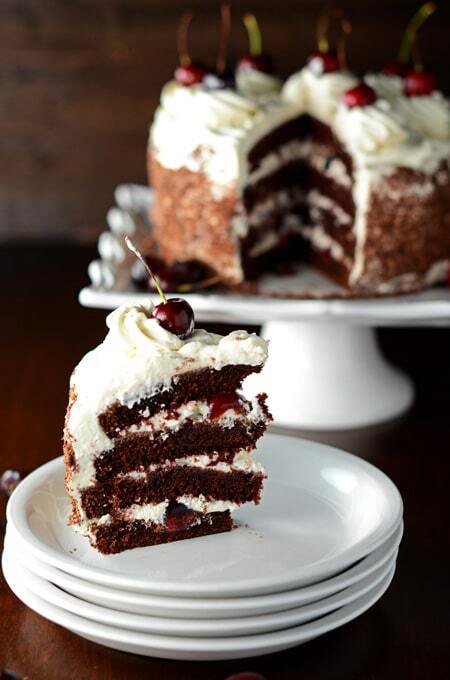 This Black Forest Cake is probably my most favorite cake of all time! It’s one of the first cake recipes I made when starting my baking journey 9 years ago. So no need to feel intimidated by this one. 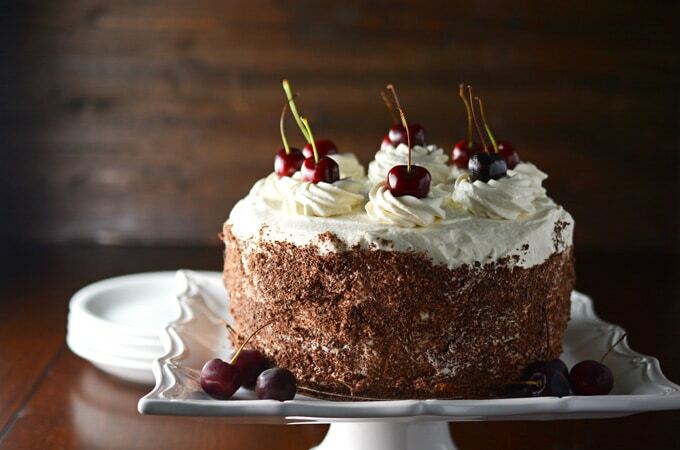 Black Forest Cake, such as this one, will have you looking like a cake connoisseur. When I make cakes like this I always start out by looking at what can be done ahead of time. I typically bake on the weekends so as soon as I get home on Friday I bake the cake layers (after my workout of course) and wrap them up and store them in a cake container on the counter until the next day. The fun (and sometimes messy) part comes on Saturday, where I make the filling and frosting and prepare the garnishes. Oh, and this is my husband’s favorite day too, because he gets to eat the cake domes I cut off the top of the cakes. If you happen to catch this recipe out of cherry season, no worries. You can use canned sour cherries and garnish with a few maraschino cherries. 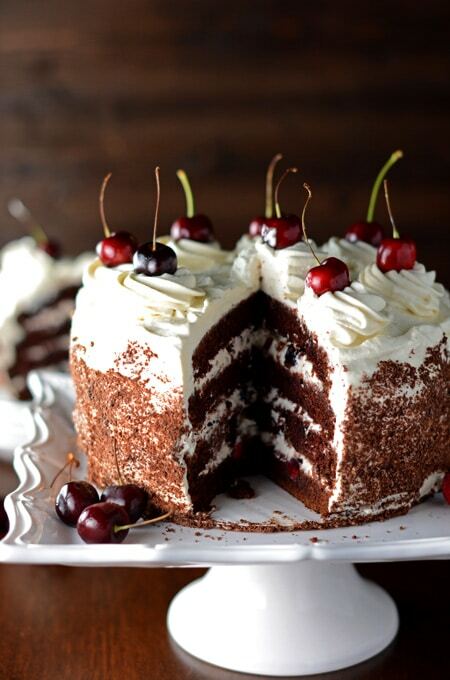 Can you believe this is the first time I’ve made this cake using fresh cherries? 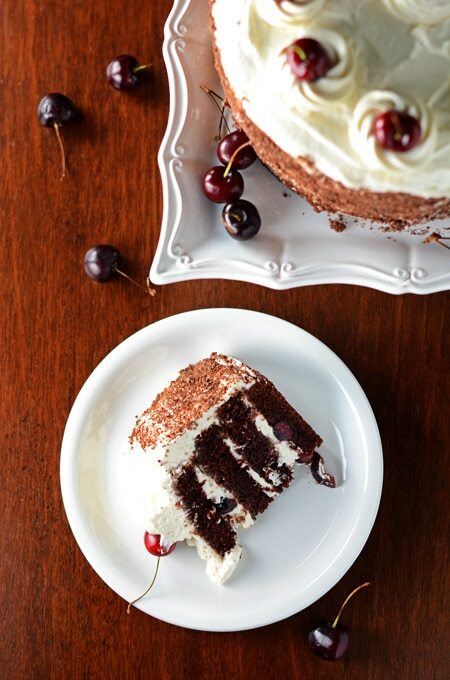 I’ve always made this cake around Christmas time so I’ve never had the opportunity to use fresh cherries. Until now, when I saw them in the supermarket and immediately said I have to make that Black Forest Cake with fresh cherries this time! I just must! 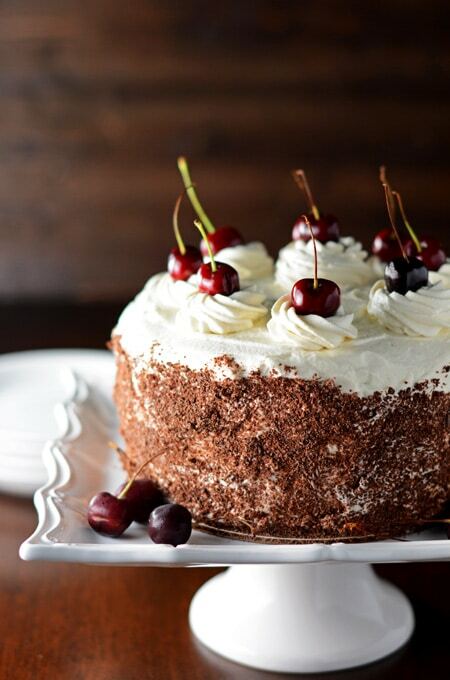 Whether you are using fresh or canned cherries this cake is absolutely amazing! 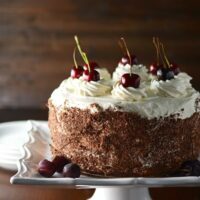 With sour cream chocolate layers, soaked in kirsch simple syrup and topped with whipped cream and cherries, you really can’t go wrong here. Enjoy. And don’t forget to follow me on social media: Facebook, Instagram, Twitter, Pinterest and Yummly. Adjust an oven rack to the middle position and preheat the oven to 350 degrees. Grease the bottom and sides of two round 8-inch cake pans with baking spray and set aside. Sift together the flour, sugar, cocoa powder, baking soda and salt into a large bowl. Whisk to combine and set aside. In a medium bowl, whisk together the eggs until combined. Whisk in the sour cream and vanilla extract until blended and set aside. In the bowl of an electric stand mixer, using the paddle attachment, mix the melted butter and oil together on low speed. Add the cold water and mix to incorporate. Add the dry ingredients all at once and mix on medium-low speed for 1 minute. Add the egg mixture and mix until blended, about 1 minute. Divide the batter into the prepared cake pans. Bake the cakes for 35 to 40 minutes, until a toothpick inserted in the center comes out with a few moist crumbs attached. Cool the cakes in their pans on a wire rack for 15 minutes. Invert cakes on to the wire racks and cool completely. At this point the cake can be wrapped in foil and stored at room temperature for up to 5 days. In a small saucepan, combine the water and sugar and bring to a boil over medium-high heat. Stirring until sugar has dissolved. Remove the pan from the heat and stir in the kirsch. Set aside at room temperature. In a chilled stand mixer bowl, using the whisk attachment, beat the cream with powdered sugar, kirsch and vanilla extract on high speed until medium peaks form. Store whipped cream in the refrigerator while you assemble the cake. Using a long serrated knife, cut off the domed top of each cake creating level cake layers. Cut each cake horizontally in half, to make 4 layers. Place once of the cake layers cut side up on a cardboard cake round or cake pedestal and brush it generously with the soaking syrup. 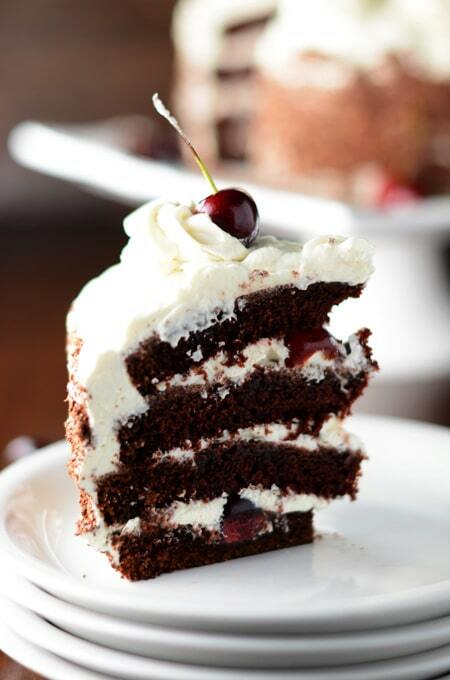 Spread 1 cup of whipped cream over the top of the cake and scatter about one-third of the cherries over the cream. Top the cake with another layer of cake and repeat this process, layering two more times. Top the last cake layer on, smooth side up and soak it with the remaining syrup. In a piping bag fitted with a large star tip or tip of your choice, place about ½ cup of whipped cream in the bag for decorating and set aside. Using your piping bag, pipe rosettes around the edge on the top of the cake. Top each rosette with a cherry. Serve the cake immediately or store in the refrigerator for up to 3 hours. This cake is best served the day it is made. This cake is best served the same day it is made.